Far south of the group of large islands that comprises most of Japan, the country hosts a tropical paradise. 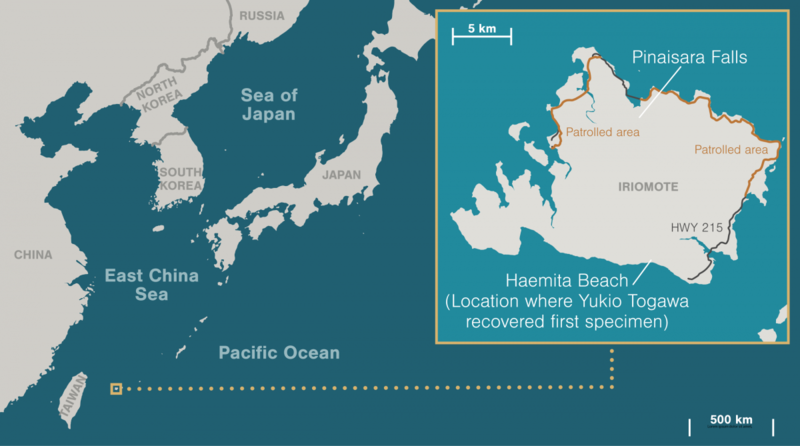 It’s a smattering of 160 islands that extends across some 1,000 kilometers of the East China Sea. Okinawa is the most famous, but Iriomote—a 284-square-kilometer speck of green just shy of Taiwan—is a close second. Subsistence farmers work a small fraction of the land, wading in rice paddies and tending bristly fields of pineapples and sugar cane. The other 90 percent of the island’s original habitat is intact—dense subtropical forest, mangrove-lined canals, and wind-whipped beaches. Abundant springs and cascading waterfalls flow from the island’s mountainous core, lifeblood for animals and Iriomote’s 2,400 human residents alike. Hiko Tsukayama has lived on Iriomote all his life. Stubbled and quick to smile, with an unruly mop of white hair and strong, tanned hands, he raises cattle and grows fruit on land his father first cultivated. The 67-year-old describes himself as “a living encyclopedia” of the island’s history. Lately, he’s been keeping tabs on a particularly grim series of incidents. In June 2018, he was driving along highway 215, the only major road, with rice paddies on his left and the Urauchi River on his right, when a small feline leapt from a patch of bushes and dashed in front of his car. Tsukayama slammed on the brakes just in time, but the cat struck the side of an oncoming car with a thunk, then rose and darted into the leafy woods. The other driver stopped and rolled down his window to meet Tsukayama’s eyes. Tsukayama knew the man—on Iriomote, everyone knows everyone. He looked rattled, his face pale with worry. “Was the thing that hit my car an Iriomote cat?” he asked. “Yes,” Tsukayama replied, “but the cat seemed to be okay.” The man slumped at the steering wheel and sighed with relief. The feline is a subspecies of leopard cat and looks like a large, gray tabby but with rounder ears and spots rather than stripes. And though it could easily be mistaken for a house cat, it exists nowhere in the world beyond this tiny island. It’s also critically endangered. The total population hovers between 100 and 150, in part because the island’s size naturally constrains it. This leaves it exceptionally vulnerable to extinction. As a young man, Tsukayama never saw dead cats on the road. Now, the death toll is stacking up. About a month prior to Tsukayama’s near miss, a resident found a dead female cat crumpled on the side of the road. Rangers from Japan’s Ministry of the Environment later discovered two starving kittens mewling nearby. (Both have since been rehabilitated and released.) Their mother was the third confirmed fatality last year. The world’s 40 species of wildcats and their subspecies are diverse and widespread, ranging from Scotland and South Africa to Afghanistan and Vietnam. Iriomote is the world’s smallest island to host them. Researchers are not sure how many cats the island could support, but they believe it would be fewer than 1,000 given the felines’ territory size and territorial behavior, says Masako Izawa, an ecologist at the University of the Ryukyus in Okinawa. The current population is likely under capacity, she says, because of car strikes and habitat encroachment by tourists. Iriomote wildcats have made the most of their tiny home by being resourceful, Izawa says. Having spent 90,000 years on an island without the small mammals (save fruit bats) that other wildcats tend to rely on, they are one of the least picky eaters of all felines. They dine on birds, lizards, frogs, crabs, shrimp, snakes, and insects. Unlike most other cats, they do not shy away from water; they’re happy to plunge into a stream or river in pursuit of prey. For a long time, however, Iriomote’s human residents saw the cat as just another part of the forest. “We didn’t recognize that it’s a special, rare wildcat—it was just a cat that lives close to our village,” Tsukayama says. That changed in 1965, when the late Yukio Togawa, a journalist turned ecologist and novelist, visited neighboring Ishigaki island and heard rumors about a mysterious wildcat that lived on Iriomote. Togawa doubted that an island so small could support a major predator, but he resolved to find out. Stepping off the ferry at Iriomote was like traveling back in time for the Tokyo native. Electricity had only just arrived, and most residents still earned their living directly from the land, using outdated, traditional equipment. Many were poor compared to those living on Japan’s larger islands. 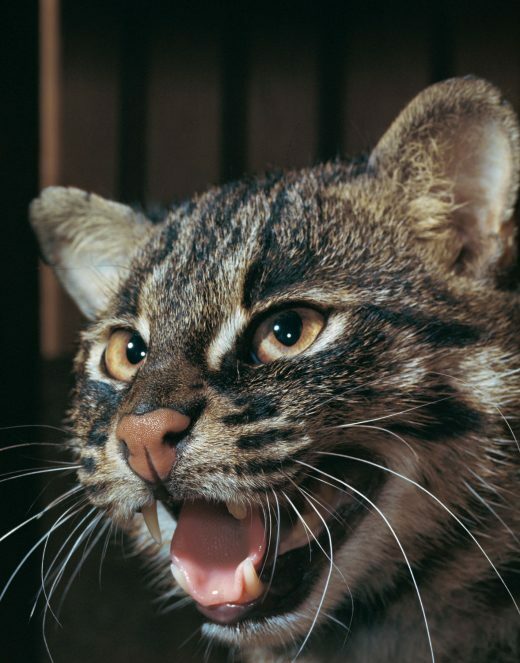 To Togawa’s delight, locals quickly confirmed that a wildcat lived among them. Sometimes they even caught it in snares meant for wild boar—and ate it all the same. Togawa managed to obtain a skull and two furs from villagers, which he brought back to Tokyo. On a second trip, he found a complete specimen: the dug-up remains of an ailing cat that some junior high school students had trapped on a beach and buried after it died. 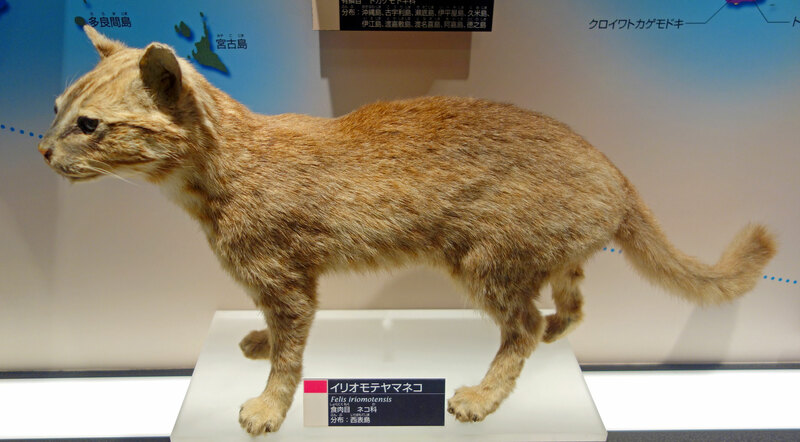 Scientists excitedly confirmed that Togawa had found a unique type of wildcat. Togawa wanted to learn more about the fascinating animals, so two years later, he brought back two live Iriomote cats that villagers had trapped for him. His daughter Kumi, a teenager at the time, remembers her annoyance when her father converted her bedroom into a temporary cat pen. “The smell was so bad—like a zoo!” she says. Unlike house cats, she says, the terrified wildcats did not meow, but they did hiss—a lot—and they often splashed around in their large water bowl as though it were a kiddie pool. For two years, the house was frequently visited by gaggles of reporters, until, to Kumi’s relief, her father sent the cats to live at Japan’s National Museum of Nature and Science. Their taxidermic bodies are still on display there today. Strangely, though, her father avoided the subject of wildcats after they departed. Only decades later did Kumi piece together that he might have felt guilty about his discovery. In his papers, she found a 1978 letter from an Iriomote villager complaining that the government prioritized cats over people. “Conservation of nature sounds very beautiful, but we should not be forced to live a very primeval life,” the person wrote. Islanders, Kumi learned, had reason to feel wronged. After a German scientist published a report in the late 1970s stating that Iriomote was too small to support both wildcats and people, Prince Philip, the Duke of Edinburgh, wrote to Japan’s Crown Prince Akihito to urge him to relocate the human population. The government also proposed a national park that would remove a third of the island’s land from development. Then, it cancelled a road project because it cut through key cat territory. He and his neighbors convinced representatives from the Ministry of the Environment to come see firsthand that residents coexisted well with the cats. Researchers soon confirmed this claim: rather than avoid human habitation, wildcats readily hunted in rice paddies and pineapple farms. The government dropped discussions about moving people off Iriomote and reached a compromise on the scale of the national park. Over time, local people began to view the wildcats with pride rather than resentment. They fundraised to erect a monument on the beach to the cat trapped so long ago by junior high school students since it was this cat’s skeleton that helped confirm Iriomote’s distinct wildcat species. And students today have a special annual lesson about wildcats and conservation on Iriomote. Locals even help scientists with their studies. Years after the two unwelcome felines took up residence in her bedroom, Kumi also came around to the cats. Elegant and poised, she now chairs the Japan Tiger and Elephant Fund (JTEF), a nonprofit conservation organization in Tokyo, and a few years after her father died in 2004, she and Masayuki Sakamoto, JTEF’s executive director, decided to make the Iriomote wildcat a priority. The detente was just in time. 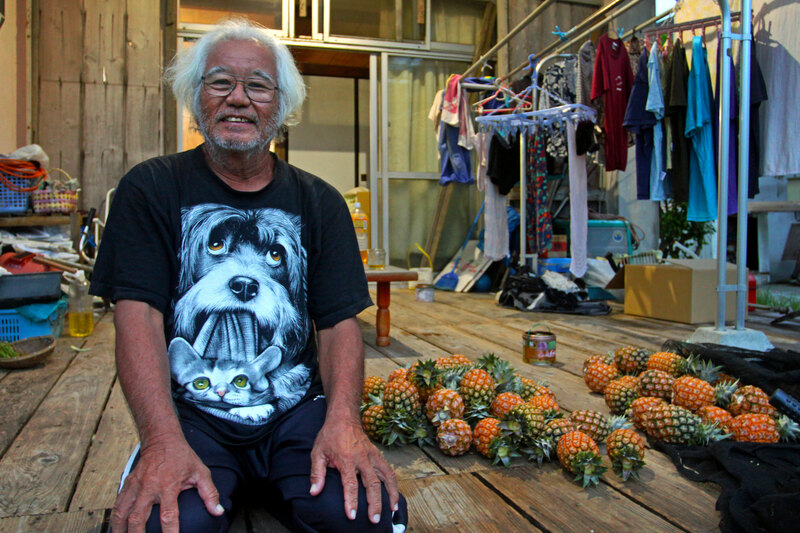 Outside interest in the island swelled from a trickle to a flood, and Tsukayama and his neighbors soon became a lifeline for the cats, trying to ensure they were not swept away. A kayaker gliding smoothly through the green-brown water of one of the island’s canals might feel like the last person on Earth. Mangroves overhang muddy banks that scuttle with crabs and mudskippers. The air is thick and silent. Iriomote can seem untouched, overlooked, secret. That feeling, though, likely won’t last. On a muggy summer afternoon, squeals of laughter, shouts of conversation, and paddle splashes echo down the channel leading to the trailhead for Pinaisara Falls, one of the island’s most popular sightseeing destinations. The beach below is crowded with kayaks in clashing candy colors, stark against the subdued green of the forest. Along the trail, tree roots stick out like veins on a bodybuilder’s arms, and deep, shoe-shaped divots are worn into the rocks by so many feet. The short path ends at a clearing where the falls—a thin, misty ribbon of white—empty into a chest-deep pool. Half a dozen tourists take turns jumping from a rock into the water. Others sit on the shore, eating oranges and reapplying bug spray. Sunscreen shimmers on the water’s surface. Lacking a restroom, visitors scramble uphill of the river to relieve themselves in the bushes. 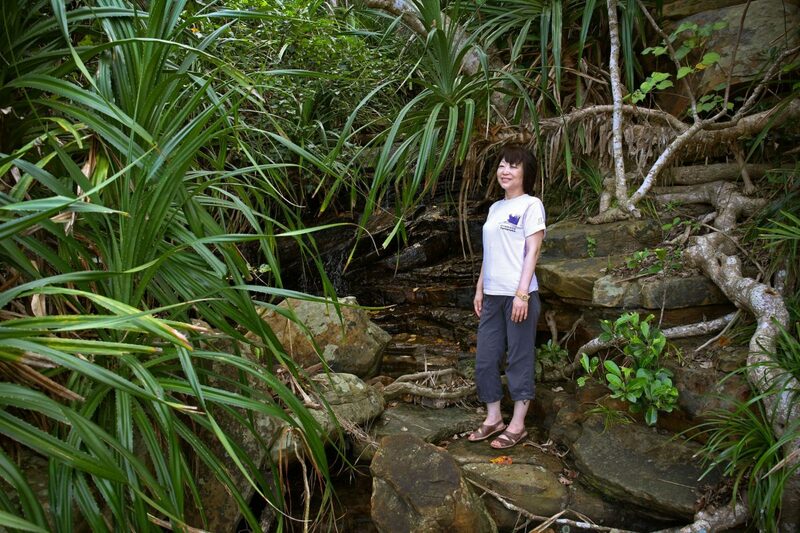 Around 20,000 visitors annually kayak and trek to Pinaisara Falls, within critical Iriomote cat habitat. But they’re only a tiny fraction of the total number of tourists swarming the island. Last year, 315,000 people visited. While this is an economic boon, strain on the environment has begun to show. And habitat degradation isn’t the only serious concern for the cats, Sakamoto says. Huge numbers of tourists may also prevent them from using key parts of their range. The main site used by such guides, a rice paddy by the side of the road, also happens to be a hotspot for wildcat hit-and-runs. Prior to 2000, no more than three dead cats turned up on the island per year, but now islanders discover as many as seven. This continues despite a number of protection strategies, including more than 100 wildlife underpasses installed along the 54-kilometer highway and fencing meant to direct animals to the tunnels. Signs that warn of the felines’ presence and remind drivers of the 40-kilometer-per-hour speed limit line the highway, and speed bumps regularly interrupt the blacktop. Local officials even post billboards depicting a leaping cat silhouette and body count for the year at the sites of the most recent fatalities. With their home base of Tokyo a world away, Togawa and Sakamoto hired Yusuke Takayama, an avid outdoorsman based on the island, to lead conservation efforts there. Takayama, who grew up near Tokyo, moved to Iriomote after growing exhausted with city life and his job in the chemical industry. Lanky, suntanned, and always in flip-flops, his laid-back vibe helped him quickly win over locals, while his analytical skills from his past career proved an asset for conservation. Initially, most islanders blamed tourists for wildcat deaths. So in 2013, Takayama spent many nights clocking passing cars and noting if there was a rental code on their license plates to distinguish tourists from locals. A few topped out at 80 kilometers per hour; he even saw a drag race. In the end, data from around 1,000 vehicles showed that it was predominately residents, not tourists, who were going too fast, averaging 46 kilometers per hour. To build on these findings, in 2016, JTEF launched the Yamaneko Patrol. On a humid evening this past July, I join them. Sakamoto and Takayama don bright-orange vests, stick a flashing yellow light to the top of their minivan, and turn onto the island’s lone highway. Takayama rolls down the windows, preferring the chorus of frogs and insects to the radio. 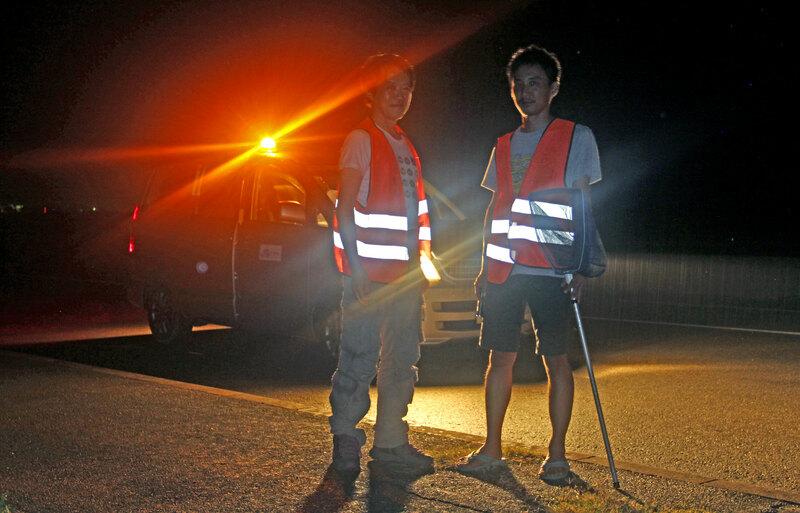 Several nights per week, they or another pair of volunteers from a pool of 20—Tsukayama among them—slowly drive back and forth along the island’s deadliest 20-kilometer stretch of road. As on the vast majority of nights, no cats leap out of the bushes, but there is still plenty to keep the pair busy. They pause to clock speeding cars. They stop every minute or so to shoo leaping frogs from the road to the safety of the bushes, chase Yorkie-sized coconut crabs away from the median, and encourage thin, lethargic snakes to slither on their way. They also have to deal with copious smashed amphibians—“frog sashimi,” as Sakamoto calls them. Roadkill attracts wildcats and increases collisions. As if playing a macabre game of golf, Takayama flicks each carcass far from the road with a long stick. 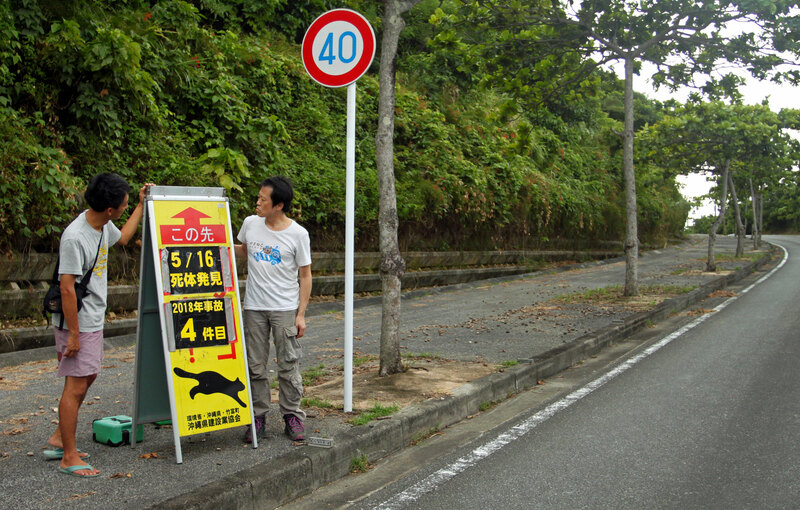 Since the Yamaneko Patrol began its work, the number of cats killed by cars has stayed level. Hopefully, it will eventually bring about a decline, says Sakamoto, but “our real purpose is to establish an opportunity for local people to participate in the conservation of wildcats.” In that sense, it already seems to be working: despite some persistent lawbreakers, locals’ average speed has dropped from 46 kilometers per hour to 42. It’s unclear, though, whether those fragile conservation gains would hold up under an onslaught of yet more visitors. Tsukayama remembers well his reaction when he first heard about the Japanese government’s plan to nominate Iriomote to become a World Heritage Site: panic. The listing, he believes, will irreparably damage the ecosystem, disrupt islanders’ ways of life, and turn Iriomote into a “neon-glittering” hub on par with mainland Japan. Moreover, he says, it would put Iriomote wildcats at risk. The listing is a volatile topic on Iriomote and nearby Ishigaki island, the jumping-off point for wildcat tourists. While everyone seems to agree that the label would be a source of pride, their opinions on whether that blessing will also be a curse differ. Like Tsukayama, most who oppose it worry there will be too little oversight of too many tourists. 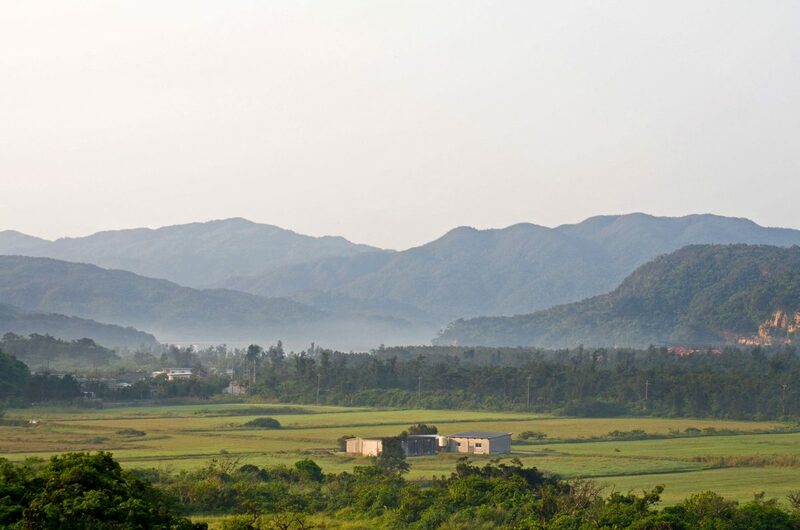 Yammie Leung, an Ishigaki resident, for example, cites the disappointing experience of visiting Shiretoko National Park, a World Heritage Site in Hokkaido, Japan’s northernmost island. “There were so many tourists visiting just for the name and to take a photo with the sign,” she recalls. There are rules in the park about where visitors can and cannot go, and the trails are often crowded. 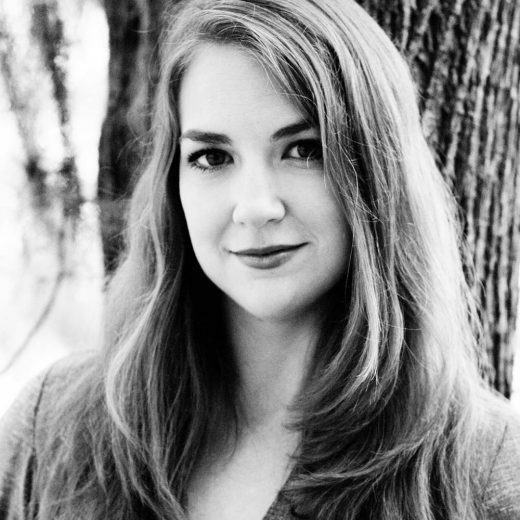 “For people who actually want to enjoy the environment, it’s not fun anymore,” she says. In April, Iriomote got an extension that could help conservationists put that lesson to use: the World Heritage committee reviewers found that the island didn’t have a holistic, sustainable strategy for managing where tourists could go and when, and hasn’t determined whether some areas should have limited access or be closed altogether. In light of this and additional concerns, Japan withdrew its nomination. While the Japanese government prepares a new application for consideration in 2020, JTEF and others are working on regulations that would ease the designation’s impact—including a visitor cap and rules about how tourists, guides, and locals can interact with Iriomote wildcats. Officials with the local government, based in the town of Taketomi on Ishigaki island, say they are keen to adopt the regulations. But putting such regulations in place is more difficult than it sounds. The government splits environmental management across different departments, complicating logistics and sometimes breeding petty power struggles. In the case of Iriomote, Taketomi has say over tourism, but no conservation authority—something Sakamoto and Togawa are working to change. The national Ministry of Agriculture, Fisheries and Forestry owns 85 percent of the island as national forest, but it’s the Ministry of the Environment that protects habitat and the endangered species it hosts. There are already signs that obstacles are piling up. The forestry agency inexplicably began “strongly standing in the way” of local efforts to control tourism in June, Sakamoto says, even though it has no legal authority to do so. He believes the agency’s resistance comes from a desire to maintain a traditional balance of power in which national authorities call the shots. But excluding local people from participating in decision-making will prove disastrous in the long-term, Sakamoto points out, because conservation can only succeed with their support. His gaze turns to the wilderness beyond his fields. Decades ago, fame drew the hidden mountain cats from the obscurity of that darkening wood. Now, he can only hope that it won’t erase them forever. 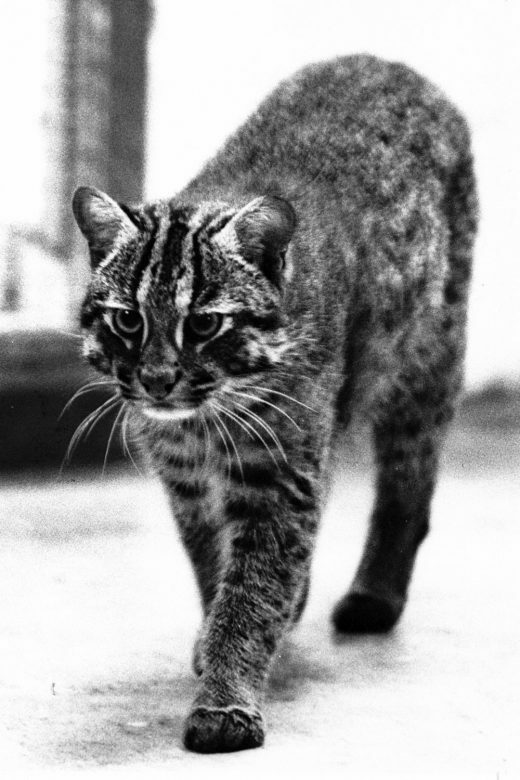 Cite this Article: Rachel Nuwer “The Risky Fame of a Rare Island Wildcat,” Hakai Magazine, Jan 8, 2019, accessed April 26th, 2019, https://www.hakaimagazine.com/features/the-risky-fame-of-a-rare-island-wildcat/.